Even in the best of times, Victoria Azarenka has trouble with Venus Williams. Azarenka certainly isn't alone in that sense. Furthermore, these aren't the best of times for her. Williams extended her mastery over Azarenka with a 6-4, 7-6 (1) victory tonight to reach the quarterfinals of the Bank of the West Classic at Stanford. Williams, 34, has never lost a set in four matches against Azarenka, all on hardcourts. Williams and Azarenka are both former top-ranked players, multiple Grand Slam singles champions (seven titles for Williams; two for Azarenka) and past Bank of the West titlists (Williams in 2000 and 2010; Azarenka in 2010). Both also have battled health issues. Williams, 34, was diagnosed with Sjogren's Syndrome, an energy-sapping autoimmune disease for which there is no known cure, in 2011. Azarenka, who turned 25 today, has missed most of this year with a left foot injury. The Belarusian has won one match in four tournaments since advancing to the quarterfinals of the Australian Open, which she won in 2012 and 2013, in January. She was seeded fourth in the Bank of the West Classic at No. 10 in the world. "I think she's still looking for her range," Williams, a wild card ranked 25th, said on wtatennis.com. "A lot of the time she played some great points, but sometimes she had some errors she wasn't expecting, and I think that'll just clear up for her the more matches she plays." Williams will take on eighth-seeded Andrea Petkovic, a free-spirited German playing in the Bank of the West Classic for the first time this year, on Friday not before 4 p.m. In the featured night match, top-ranked Serena Williams will meet fifth-seeded Ana Ivanovic at 8 p.m.
Williams is 5-1 against Ivanovic, who's ranked 11th but will return to the top 10 for the first time since May 2009 on Monday. This will be their third meeting of the year. Ivanovic won in the fourth round of the Australian Open on a hardcourt, and Williams gained revenge in the semifinals at Rome on clay in May. The day session will start at noon with third-seeded Angelique Kerber of Germany facing Garbine Muguruza of Spain, followed by unseeded Varvara Lepchenko against 19-year-old qualifier Sachia Vickery in an all-American matchup. Kerber outlasted American CoCo Vandeweghe, the 2012 runner-up to Serena Williams at Stanford as a lucky loser, 7-6 (4), 0-6, 6-2. Ivanovic, another former world No. 1 and Grand Slam singles champion (2008 French Open), dispatched qualifier Carol Zhao, a Stanford sophomore from Canada, 6-1, 6-1. Muguruza, 20, eliminated 31-year-old Daniela Hantuchova of Slovakia 6-4, 6-4. Muguruza reached her first Grand Slam quarterfinal in this year's French Open, routing Serena Williams 6-2, 6-2 in the second round. Garbine Muguruza, Spain, def. Daniela Hantuchova, Slovakia, 6-4, 6-4. Angelique Kerber (3), Germany, def. CoCo Vandeweghe, United States, 7-6 (4), 0-6, 6-2. Ana Ivanovic (5), Serbia, def. Carol Zhao, Canada, 6-1, 6-1. Venus Williams, United States, def. Victoria Azarenka (4), Belarus, 6-4, 7-6 (1). Raquel Kops-Jones and Abigail Spears (1), United States, def. Varvara Lepchenko, United States, and Ajla Tomljanovic, Croatia, 7-6 (6), 6-1. Angelique Kerber (3), Germany, vs. Garbine Muguruza, Spain. Varvara Lepchenko, United States, vs. Sachia Vickery, United States. Venus Williams, United States, vs. Andrea Petkovic (8), Germany. Serena Williams (1), United States, vs. Ana Ivanovic (5), Serbia. Daniela Hantuchova, Slovakia, and Arantxa Parra Santonja, Spain, vs. Paula Kania, Poland, and Katerina Siniakova, Czech Republic. STANFORD -- Incident? What incident? Playing for the first time since her bizarre exit from Wimbledon, Serena Williams was back to her normal self in a 7-5, 6-2 victory over Karolina Pliskova of the Czech Republic tonight in the second round of the Bank of the West Classic. "I think I played really well," the top-ranked Williams, who received a first-round bye, said after the 64-minute match. "I think I'm going in the right direction." During the day session, Varvara Lepchenko of the United States outslugged No. 2 seed and 2013 runner-up Agnieszka Radwanska of Poland 6-3, 3-6, 6-4. Both of last year's finalists already have been eliminated. Defending champion Dominika Cibulkova fell to 20-year-old Garbine Muguruza of Spain on Tuesday in the first round. Williams, 32, has won 17 Grand Slam singles titles but has failed to reach the quarterfinals in any of the year's first three majors. Three days after Williams shockingly lost to Alize Cornet of France in the third round at Wimbledon, the American star stumbled around the court and retired from her second-round doubles match with older sister Venus at 0-3 in the first set. Williams' coach, Patrick Mouratoglou, later told France's Tennis Magazine that the world No. 1 is going through a "difficult period." "I have never discussed private matters, and I am not going to talk about them now," said Mouratoglou, who has been romantically linked to Williams, although neither has confirmed it. "There have been difficult things. For sure, Serena is in a difficult phase, but I will leave it there." Williams said Monday that she would undergo a series of physical tests after the season. When asked tonight why she wouldn't have them sooner, she said, "I'm sure it's nothing serious. The hypochondriac that I am ... that's it." Williams added that she feels fine and has "moved on" from the Wimbledon incident. "I'm just doing the things I think I do best," she said. "If anyone has any questions, they're more than welcome to ask." Then, however, Williams abruptly cut off the interview after six minutes. Like Williams, Pliskova has a sister on the pro tour. But the 22-year-old Pliskova's is a twin. Karolina and Kristyna, in fact, became the first twins to win a WTA doubles title when they triumphed last year in Linz, Austria. Both Williams and Karolina Pliskova, 6-foot-1 (1.86 meters), have punishing serves. Williams was mentally tougher, though, breaking Pliskova three times and never losing her own serve. Williams recorded the only break of the first set in the last game, at love. After double-faulting for 0-30, Pliskova sent a forehand long and netted a backhand to drop the set. Williams bolted to a 3-0 lead (one break) in the second set and broke again in the final game for the match when Pliskova sailed another forehand long. Overall, Williams won 82 percent of her first-serve points and had nine aces against three double faults. "I was playing a player that I knew was going to be very difficult to break, so mentally you have to really, really try to hold onto your serve," Williams said. "It was really important to make sure I was super-focused on my serve." Radwanska, at No. 5 in the world, is the highest-ranked player Lepchenko has beaten. Lepchenko's previous best wins came against No. 6 Jelena Jankovic and No. 7 Sara Errani. Lepchenko, a 28-year-old left-hander from Uzbekistan, became a U.S. citizen in 2011. She had been 0-5 against Radwanska, including a three-setter in last year's Bank of the West quarterfinals. Lepchenko will meet 19-year-old qualifier Sachia Vickery in Friday's quarterfinals, guaranteeing that an American will play in the semifinals. Vickery, a quarterfinalist in the recent Sacramento Challenger, beat Monica Puig of Puerto Rico 6-7 (4), 6-2, 6-1 to reach her the last eight in a WTA tournament for the first time. Eighth-seeded Andrea Petkovic dismissed Naomi Osaka, a 16-year-old qualifier from Japan, 6-2, 6-2, in a matchup of free spirits. Petkovic, a 26-year-old German, reached the French Open semifinals last month for her best Grand Slam result. Osaka, 5-foot-11 (1.80 meters) with a massive forehand, stunned 2011 U.S. Open champion Samantha Stosur in the first round. Osaka has a Haitian father, a Japanese mother and an 18-year-old sister, Mari, who lost in the first round of qualifying in the Bank of the West Classic. Sachia Vickery, United States, def. Monica Puig, Puerto Rico, 6-7 (4), 6-2, 6-1. Varvara Lepchenko, United States, def. Agnieszka Radwanska (2), Poland, 6-3, 3-6, 6-4. Andrea Petkovic (8), Germany, def. Naomi Osaka, Japan, 6-2, 6-2. Serena Williams (1), United States, def. Karolina Pliskova, Czech Republic, 7-5, 6-2. Daniela Hantuchova, Slovakia, and Arantxa Parra Santonja, Spain, def. Daria Gavrilova, Russia, and Yi-Fan Xu, China, 3-6, 7-6 (2) [10-8]. Paula Kania, Poland, and Katerina Siniakova, Czech Republic, def. Hao-Ching Chan, China, and Andrea Petkovic (8), Germany, 6-2, 3-6 [10-8]. Garbine Muguruza and Carla Suarez Navarro (3), Spain, def. Caroline Garcia, France, and Shuai Zhang, China, 6-0, 7-5. Garbine Muguruza, Spain, vs. Daniela Hantuchova, Slovakia. CoCo Vandeweghe, United States, vs. Angelique Kerber (3), Germany. Ana Ivanovic (5), Serbia, vs. Carol Zhao, Canada. Victoria Azarenka (4), Belarus, vs. Venus Williams, United States. Raquel Kops-Jones and Abigail Spears (1), United States, vs. Varvara Lepchenko, United States, and Ajla Tomljanovic, Croatia. Classic at Stanford. Photo courtesy of Bank of the West Classic. STANFORD -- Venus Williams lost her record for the world's fastest serve by a woman but won her match. Sabine Lisicki unleashed a 131-mph (210.8-kph) rocket in a 7-6 (2), 6-1 loss to fifth-seeded Ana Ivanovic today in the first round of the Bank of the West Classic at the Taube Family Tennis Stadium. Lisicki was aided by hot (84 degrees/28.9 Celsius), dry weather but not elevation (Stanford is 30 feet/9.1 meters above sea level). "Well ... at least I broke the world record for fastest serve," tweeted Lisicki, the runner-up to Marion Bartoli at Wimbledon last year. Williams, who held the previous mark of 129 mph (207.6 kph), overpowered qualifier Paula Kania of Poland 6-3, 6-2 in the featured night match. Meanwhile, rising star Garbine Muguruza ousted defending champion Dominika Cibulkova, seeded sixth, 6-2, 4-6, 6-2. It was the Bank of the West debut for the 6-foot (1.82-meter) Muguruza, who's ranked 28th in the world at 20 years old. Muguruza plays for Spain, where she lives, but might switch to Venezuela, her native country. Her father is Spanish and her mother Venezuelan. Muguruza reached her first Grand Slam quarterfinal last month in the French Open, routing top-ranked Serena Williams 6-2, 6-2 in the second round. Cibulkova, 25, of Slovakia advanced to her first Grand Slam final in January in the Australian Open, falling to Li Na. Also losing was seventh-seeded Carla Suarez Navarro. The 5-foot-4 (1.62-meter) Spaniard, ranked 16th, fell 6-3, 7-5 to Monica Puig of Puerto Rico despite holding three set points at 5-4 in the second set. Williams set her serving mark in the 2007 U.S. Open. Williams said she was glad Lisicki broke her record. "I think it's time it's broken," Williams, 34, said with her characteristic graciousness after her serve topped out at a mere 120 mph (193.1 kph) against Kania. "That's a good thing, I think. I guess I have to start trying to serve harder. Clearly, she serves really hard. That's good encouragement. "I'm not really trying to serve hard, though. I used to. When I really want the point, that's when I start to serve a little bit harder, but I (usually) hit a medium serve that goes somewhere above 110 (177.0 kph). "I'm trying more for placement these days. It takes a lot of energy to serve, so if you can take off 10 miles an hour (16.1 kph) and place it, this is smarter. I need to serve harder now, I guess." Samuel Groth of Australia holds the men's record for the world's fastest serve, 163.7 mph (263.4 kph) in the 2012 Busan (South Korea) Challenger. Ivo Karlovic, a 6-foot-11 (2.11-meter) Croat, owns the mark at the top level of men's tennis with a 156-mph (251.1-kph) blast in the first round of the 2011 Davis Cup against Germany. Williams, playing in the Bank of the West Classic for the first time since losing to Bartoli in the 2009 final, will meet fourth-seeded Victoria Azarenka on Thursday in the second round. Azarenka, who will turn 25 on Thursday, received a first-round bye. Both also have battled health issues. Williams was diagnosed with Sjogren's Syndrome, an energy-sapping autoimmune disease, in 2011. Azarenka has missed most of this year with a left foot injury. Williams, a lean 6-foot-1 (1.85 meters), has fallen to 25th and hasn't won a major singles title in six years, but she remains a threat. Last month, the five-time Wimbledon singles champion came within two points of beating eventual winner Petra Kvitova in the third round at the All England Club. Williams said she'll continue playing "as long as I'm good. I'm running pretty fast. If I get slow and terrible, then I'll stop. "I'm not having kids right now, it seems, and I don't have a husband telling me what to do and we don't have to argue every day," Williams continued with a laugh, "so for me it's easy to keep playing tennis." Williams made her pro debut 20 years ago at 14 in the Bank of the West Classic, beating American veteran Shaun Stafford in the first round before losing to top-seeded and second-ranked Arantxa Sanchez-Vicario of Spain. At the time, the tournament was held across San Francisco Bay in the Oakland Coliseum Arena in the fall. "It's great to still be feeling well enough to play on this tour," said Williams, a two-time Bank of the West champion (2000 and 2002) and five-time runner-up (1998, 1999, 2004, 2005 and 2009). "It's much more competitive than 20 years ago, and it's great to be looking pretty solid, too. "It's been a long journey. I don't know at that age if I would have envisioned that I'd still be playing, but I'm glad I am because you get one shot at it, and then you fade to gray somewhere and someone else is better. So while I'm here, I'm going to go for it." Carol Zhao, Canada, def. Yanina Wickmayer, Belgium, 6-2, 1-0, retired. Monica Puig, Puerto Rico, def. Carlo Suarez Navarro (7), Spain, 6-3, 7-5. Garbine Muguruza, Spain, def. Dominika Cibulkova (6), Slovakia, 6-2, 4-6, 6-2. Ana Ivanovic (5), Serbia, def. Sabine Lisicki, Germany, 7-6 (2), 6-1. Venus Williams, United States, def. 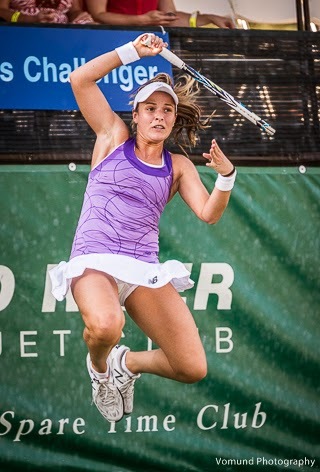 Paula Kania, Poland, 6-3, 6-2. Daniela Hantuchova, Slovakia, def. Paula Ormaechea, Argentina, 6-3, 6-4. Varvara Lepchenko, United States, and Ajla Tomljanovic, Croatia, def. Mari Osaka, Japan, and Marina Shamayko, Russia, 6-1, 6-0. Carolina Garcia, France, and Shuai Zhang, China, def. Kristie Ahn, United States, and Carol Zhao, Canada, 3-6, 6-1 [12-10]. Alla Kudryavtseva, Russia, and Anastasia Rodionova (2), Australia, def. Mirjana Lucic-Baroni, Croatia, and Karolina Pliskova, Czech Republic, 6-1, 6-0. Monica Puig, Puerto Rico, vs. Sachia Vickery, United States. Agnieszka Radwanska (2), Poland, vs. Varvara Lepchenko, United States. Andrea Petkovic (8), Germany, vs. Naomi Osaka, Japan. Serena Williams (1), United States, vs. Karolina Pliskova, Czech Republic. Hao-Ching Chan, Taiwan, and Andrea Petkovic (4), Germany, vs. Paula Kania, Poland, and Katerina Siniakova, Czech Republic. Daniela Hantuchova, Slovakia, and Arantxa Parra Santonja, Spain, vs. Daria Gavrilova, Russia, and Yi-Fan Xu, China. Caroline Garcia, France, and Shuai Zhang, China, vs. Garbine Muguruza and Carla Suarez Navarro (3), Spain. Samantha Stosur's tailspin in the Bank of the West Classic continued Monday. The 2011 U.S. Open champion lost to Naomi Osaka, a 16-year-old qualifier from Japan playing in her first main-draw match on the WTA tour, 4-6, 7-6 (7), 7-5 in the first round at Stanford's Taube Family Tennis Stadium. Stosur, ranked one spot out of the seedings at No. 19 in the world, held a match point at 7-6 in the tiebreaker and led 5-3 in the third set. The 30-year-old Australian has not won a match in the Bank of the West Classic since reaching the semifinals for the second straight year in 2010. She lost in the second round to Sabine Lisicki in 2011 and to Olga Govortsova last year after drawing first-round byes and did not play in 2012. Meanwhile, Karolina Pliskova of the Czech Republic dispatched 43-year-old Kimiko Date-Krumm of Japan 6-1, 6-3 to set up a meeting with top-ranked Serena Williams on Wednesday at 7 p.m. Williams had a bye in the first round. CoCo Vandeweghe, the runner-up in the Bank of the West to Williams as a lucky loser two years ago, topped wild card Kristie Ahn 6-2, 7-5. Ahn graduated from Stanford last month. Osaka and Vandeweghe will play seeded Germans in the second round. Osaka will face No. 8 Andrea Petkovic, and Vandeweghe will meet No. 3 Angelique Kerber. Sixth-seeded Dominika Cibulkova of Slovakia will open the defense of her Bank of the West title against rising star Garbine Muguruza, 20, today not before 1 p.m.
Muguruza, a 6-foot (1.82-meter) Venezuela native who plays for Spain, upset Williams in the second round of the French Open this year en route to the quarterfinals. Following the Cibulkova-Muguruza match, No. 5 seed and 2008 French Open champion Ana Ivanovic of Serbia will take on 2013 Wimbledon runner-up Sabine Lisicki of Germany. In tonight's featured match at 7, seven-time Grand Slam singles champion Venus Williams will play qualifier Paula Kania of Poland. Williams won the Bank of the West title in 2000 and 2002. Now 34, she will appear in the tournament for the first time since losing to Marion Bartoli in the 2009 final. Karolina Pliskova, Czech Republic, def. Kimiko Date-Krumm, Japan, 6-1, 6-3. Naomi Osaka, Japan, def. Samantha Stosur, Australia, 4-6, 7-6 (7), 7-5. Varvara Lepchenko, United States, def. Caroline Garcia, France, 6-4, 6-3. Sachia Vickery, United States, vs. Shuai Zhang, China, 6-1, 6-2. Andrea Petkovic (8), Germany, def. Ajla Tomljanovic, Croatia, 6-1, 6-4. CoCo Vandeweghe, United States, def. Kristie Ahn, United States, 6-2, 7-5. Garbine Muguruza, Spain and Carla Suarez Navarro (3), Spain, def. Eva Hrdinova, Czech Republic, and Andreja Klepac, Slovenia, 6-4, 6-2. Mirjana Lucic-Baroni, Croatia, and Karolina Pliskova, Czech Republic, def. Darija Jurak, Croatia, and Megan Moulton-Levy, United States, 4-6, 6-4 [10-7]. Alla Kudryavtseva, Russia, and Anastasia Rodionova (2), Australia, def. Paula Ormaechea, Argentina, and Aleksandra Wozniak, Canada, walkover. Yanina Wickmayer, Belgium, vs. Carol Zhao, Canada. Dominika Cibulkova (6), Slovakia, vs. Garbine Muguruza, Spain. Ana Ivanovic (5), Serbia, vs. Sabine Lisicki, Germany. Venus Williams, United States, vs. Paula Kania, Poland. Daniela Hantuchova, Slovakia, vs. Paula Ormaechea, Argentina. Carla Suarez Navarro (7), Spain, vs. Monica Puig, Puerto Rico. Varvara Lepchenko, United States,and Ajla Tomljanovic, Croatia, vs. Mari Osaka, Japan, and Marina Shamayko, Russia. Caroline Garcia, France, and Shuai Zhang, China, vs. Kristie Ahn, United States, and Carol Zhao, Canada. Alla Kudryavtseva, Russia, and Anastasia Rodionova (2), Australia, vs. Mirjana Lucic-Baroni, Croatia, and Karolina Pliskova, Czech Republic. 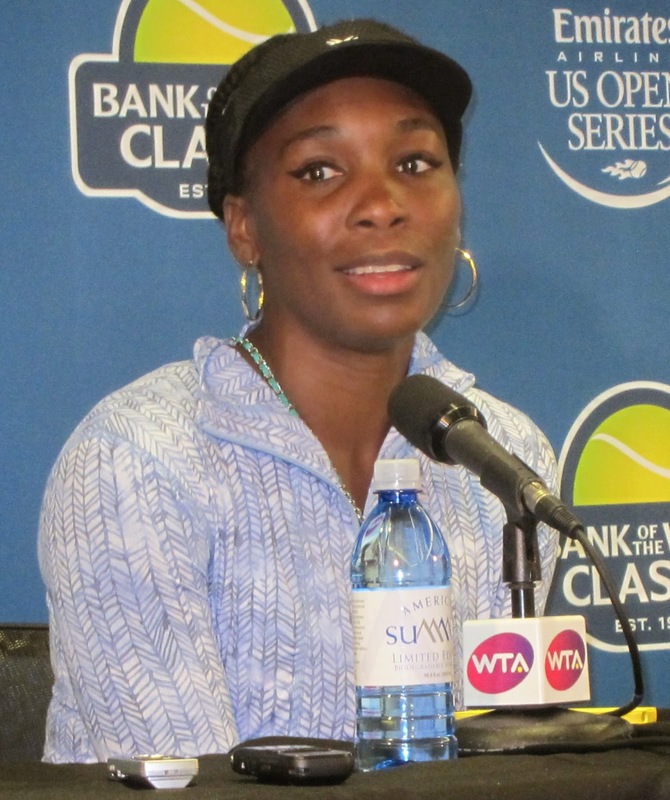 Seven-time Grand Slam singles champion Venus Williams will face qualifier Paula Kania of Poland on Tuesday at 7 p.m. in the first round of the Bank of the West Classic at Stanford, tournament organizers announced Sunday. Williams is scheduled to appear in the tournament for the first time since losing to Marion Bartoli in the 2009 final. If Williams wins, she will meet fourth-seeded Victoria Azarenka, who received a first-round bye, on Thursday in a matchup of former world No. 1s and ex-Bank of the West champions. Williams triumphed at Stanford in 2000 and 2002, and Azarenka in 2010. Williams, 34, and Azarenka, who will turn 25 on Thursday, also have battled health issues. Williams was diagnosed with Sjogren's Syndrome, an energy-sapping disease, in 2011. The last of her seven Grand Slam singles titles came at Wimbledon in 2008. Azarenka has missed most of the year with a left foot injury. Dominika Cibulkova, a 5-foot-3 (1.61-meter) veteran from Slovakia, will open the defense of her Bank of the West Classic title against rising star Garbine Muguruza, 20, on Tuesday not before 1 p.m. Muguruza, a 6-foot (1.82-meter) Venezuela native who plays for Spain, upset Serena Williams in the second round of the French Open this year en route to the quarterfinals. Serena Williams, like her older sister, has won the Bank of the West twice (2011 and 2012). She will return Wednesday night, against either 43-year-old Kimiko Date-Krumm of Japan and Karolina Pliskova of the Czech Republic, after drawing a first-round bye and skipping last year's tournament. Samantha Stosur, the 2011 U.S. Open champion, will headline today's session when she takes on qualifier Naomi Osaka of Japan not before 1 p.m. Eighth-seeded Andrea Petkovic of Germany will kick off the night session at 7 p.m. against Ajla Tomljanovic of Croatia, followed by 2012 runner-up CoCo Vandeweghe against recent Stanford graduate Kristie Ahn in an All-American encounter. See below for today's full schedule. In the final round of qualifying on Sunday, sixth-seeded Sachia Vickery of Hollywood, Fla., ousted No. 1 seed Aleksandra Wozniak, the 2008 Bank of the West champion from Canada, 6-4, 6-1. Carol Zhao, a Stanford sophomore from Canada, advanced to the main draw with a 6-1, 1-6, 6-4 victory over ninth-seeded Marina Shamayko of Russia. To purchase tickets to the Bank of the West Classic, visit www.bankofthewestclassic.com or call 866-WTA-TIXS (866-982-8497). Sachia Vickery (6), United States, def. Aleksandra Wozniak (1), Canada, 6-4, 6-1. Carol Zhao, Canada, def. Marina Shamayko (9), Russia, 6-1, 1-6, 6-4. Paula Kania (5), Poland, def. Raquel Kops-Jones, United States, 6-4, 6-1. Naomi Osaka, Japan, def. Petra Martic (7), Croatia, 6-7 (4), 6-4, 6-1. Kimiko Date-Krumm, Japan, vs. Karolina Pliskova, Czech Republic. Samantha Stosur, Australia, vs. Naomi Osaka, Japan. Caroline Garcia, France, vs. Varvara Lepchenko, United States. Ajla Tomljanovic, Croatia, vs. Andrea Petkovic (8), Germany. CoCo Vandeweghe, United States, vs. Kristie Ahn, United States. Eva Hrdinova, Czech Republic, and Andreja Klepac, Slovenia, vs. Garbine Muguruza, Spain and Carla Suarez Navarro (3), Spain. Sachia Vickery, United States, vs. Shuai Zhang, China. Mirjana Lucic-Baroni, Croatia, and Karolina Pliskova, Czech Republic, vs. Darija Jurak, Croatia, and Megan Moulton-Levy, United States. The sad story of Mirjana Lucic-Baroni continued to play out on Saturday at Stanford. 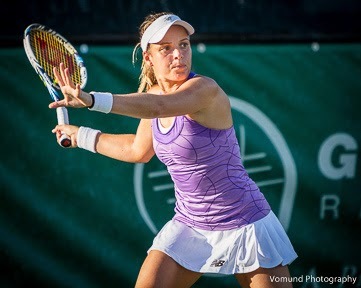 The former prodigy, now 32, lost to doubles specialist Raquel Kops-Jones of San Jose 6-2, 7-6 (8) in the first round of qualifying for the Bank of the West Classic. Lucic-Baroni, from Croatia, was seeded third at No. 127 in the world. Kops-Jones, 31, is ranked No. 1,038 in singles but No. 13 in doubles. Lucic-Baroni became the youngest player to win an Australian Open title when she took the 1998 women's doubles crown at 15 years, 10 months with Martina Hingis. At 17, Lucic reached the 1999 Wimbledon singles semifinals. She was the lowest-ranked player (No. 134) at the time to reach a Grand Slam semifinal but has been surpassed. Kops-Jones, who won last year's doubles title in the Bank of the West Classic with Abigail Spears of San Diego, will play fifth-seeded Paula Kania of Poland today for a berth in the singles main draw. Also advancing was Stanford sophomore Carol Zhao. The 19-year-old Canadian edged second-seeded Katerina Siniakova, an 18-year-old Czech ranked No. 123 in the world, 5-7, 6-4, 7-6 (3). Siniakova captured the girls doubles title at the French Open, Wimbledon and the U.S. Open last year with countrywoman Barbora Krejcikova. Top-seeded Alexsandra Wozniak, a Canadian who won the 2008 Bank of the West, defeated another Stanford sophomore, Caroline Doyle of San Francisco, 7-5, 6-3. Sixth-seeded Sachia Vickery of Hollywood, Fla., outplayed 15-year-old Michaela Gordon of nearby Los Altos Hills 6-4, 6-1. Raquel Kops-Jones, United States, def. Mirjana Lucic-Baroni (3), Croatia, 6-2, 7-6 (8). Petra Martic (7), Croatia, def. Arantxa Parra Santonja, Spain, 6-4, 6-2. Aleksandra Wozniak (1), Canada, def. Caroline Doyle, United States, 7-5, 6-3. Carol Zhao, United States, def. Katerina Siniakova (2), Czech Republic, 5-7, 6-4, 7-6 (3). Paula Kania (5), Poland, def. Daria Gavrilova, Russia, 3-6, 6-3, 6-4. Naomi Osaka, Japan, def. Alla Kudryavtseva (4), Russia, 6-4, 3-6, 6-1. Sachia Vickery (6), United States, def. Michaela Gordon, United States, 6-4, 6-1. Marina Shamayko, Russia, def. Mari Osaka, Japan, 2-6, 6-3, 6-3. Petra Martic (7), Croatia, vs. Naomi Osaka, Japan. Paula Kania (5), Poland, vs. Raquel Kops-Jones, United States. Aleksandra Wozniak (1), Canada, vs. Sachia Vickery (6), United States. Marina Shamayko, Russia, vs. Carol Zhao, Canada. lucky loser CoCo Vandeweghe for the 2012 title. ment at Stanford's Taube Family Tennis Stadium. On Wednesday night at Stanford, Serena Williams is scheduled to return to the court for the first time since her bizarre exit from Wimbledon. Seeded first in the Bank of the West Classic, Williams received a first-round bye. She will meet the winner of the match between 22-year-old Karolina Pliskova, a Czech ranked 45th in the world, and 43-year-old Japanese veteran Kimiko Date-Krumm, ranked 87th. The draw for the tournament at the Taube Family Tennis Stadium was held Friday. Qualifying begins today (see schedule below), and the main draw is set for Monday through Aug. 3. Three days after a shocking loss to Alize Cornet of France in the third round at Wimbledon, a disoriented Williams retired from her second-round doubles match with sister Venus at 0-3 in the first set on July 1. Serena had trouble bouncing and catching the ball before serving, double-faulted feebly all four times at 0-2 and quit in tears. The official explanation was that Williams was suffering from a "viral illness." Later in July, Williams' coach, Patrick Mouratoglou, told France's Tennis Magazine that the world No. 1 is going through a "difficult period." This will be the second time in three years that Williams, 32, has come to Stanford under strange circumstances. Shortly after winning Wimbledon in 2010, she received 12 stitches in one foot and six in another when she was cut by glass at a restaurant in Munich. One week later, Williams had surgery for a lacerated tendon on the top of her right foot. In February 2011, she was treated for life-threatening blood clots in her lungs. In all, Williams sat out for 11 months. In the third tournament of her comeback, she won the Bank of the West Classic for the first time in 2011. Williams repeated in 2012 but did not play last year. With one more Grand Slam singles title, Williams can tie Chris Evert and Martina Navratilova for fourth on the all-time list at 18. However, Williams has lost in the fourth round or earlier in all three majors this year. Venus Williams, who won the Bank of the West Classic in 2000 and 2002, is scheduled to return for the first time since losing to Marion Bartoli in the 2009 final. Venus, 34, will face a qualifier to be determined in the first round and could meet fourth-seeded Victoria Azarenka, the 2010 champion, in the second round. Both former world No. 1s have had their own health issues. Venus was diagnosed with Sjogren's Syndrome, an energy-sapping disease, in 2011. The last of her seven Grand Slam singles titles came at Wimbledon in 2008. Azarenka, a two-time Australian Open champion, has missed most of this year with a left foot injury. The Bank of the West Classic features six of the world's top 12: Serena Williams; No. 5 Agnieszka Radwanska, last year's runner-up; No. 8 Angelique Kerber; No. 10 Azarenka; No. 11 Ana Ivanovic, formerly No. 1; and No. 12 Dominika Cibulkova, the defending champion. To purchase tickets for the Bank of the West Classic, visit www.bankofthewestclassic.com or call 866-WTA-TIXS (866-982-8497). Mirjana Lucic-Baroni, Croatia, vs. Raquel Kops-Jones, United States. Arantxa Parra Santonja, Spain, vs. Petra Martic, Croatia. Aleksandra Wozniak, Canada, vs. Caroline Doyle, United States. Katerina Siniakova, Czech Republic, vs. Carol Zhao, United States. Daria Gavrilova, Russia, vs. Paula Kania, Poland. Alla Kudryavtseva, Russia, vs. Naomi Osaka, Japan. Michaela Gordon, United States, vs. Sachia Vickery, United States. Marina Shamayko, Russia, vs. Yi-Fan Xu, China. 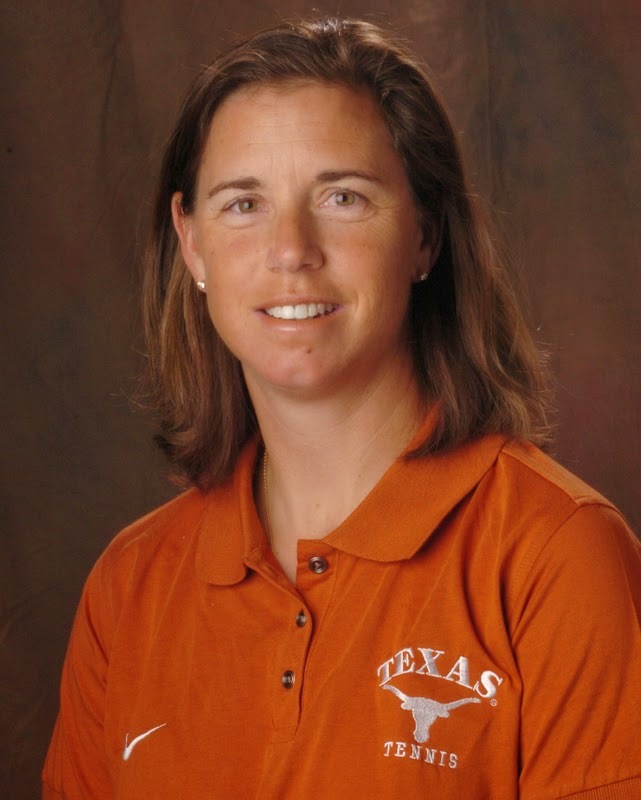 Patty Fendick-McCain, a Sacramento native who starred at Stanford and in professional tennis, recently announced her retirement after nine years as the women's head coach at the University of Texas. Fendick-McCain, 49, led the Longhorns to the NCAA Championships each year, including appearances in the round of 16 in 2008, 2010 and 2012. Fendick-McCain went 158-83 (.656) at Texas and 281-149 (.653) in her 17-year head-coaching career. Before coming to Texas, she guided the University of Washington for eight years. "It is difficult to leave college coaching after pouring everything I have into it for 17 years," Fendick-McCain said on texassports.com. "But, I am looking forward to focusing on my family – my husband, Scott, my two daughters and my son. I thank UT for the opportunity to coach at such a great institution. I will miss all of the student-athletes that have worked so hard for us and all of the friends I have made at UT." Scott McCain, a 56-year-old Merced native, coaches professional players. He earned All-America honors at Cal and played on the pro tour in the mid-1980s. Fendick-McCain won NCAA singles titles in 1986 and 1987 and was selected in 2006 as the NCAA Division I Women's Tennis Most Outstanding Student-Athlete of the sport's first 25 years. She also was named as the MVP of the NCAA's All-Decade Team for the 1980s. Texas has yet to name Fendick-McCain's successor. Challenger, jumped 25 spots to a career-high No. 142 in the world. Former Stanford star Nicole Gibbs rose 25 places to a career-high No. 142 in the world by winning last week's USTA Player Development Women's $50,000 Classic in Carson. Gibbs, 21, defeated Melanie Oudin 6-4, 6-4 for her fourth career ITF (minor-league) singles title. Oudin, 22, reached the U.S. Open quarterfinals in 2009, climbed to a career-high No. 31 in 2010 and won the U.S. Open mixed doubles title with fellow American Jack Sock in 2011. Gibbs practices at the USTA Training Center West, the site of the Carson tournament. She lives in Marina del Rey and grew up in Santa Monica, both near Carson in the Los Angeles area. Gibbs became the fifth woman in history -- and fourth from Stanford -- to win back-to-back NCAA singles titles (2012 and 2013). She also won the 2012 NCAA doubles crown with Mallory Burdette and led the Cardinal to the 2013 team title. Bradley Klahn, 23 years old, 2010 NCAA singles champion and 2011 NCAA doubles runner-up from Stanford -- No. 85 in singles (-8), No. 200 in doubles (-23). Scott Lipsky, 32 years old, 2002 NCAA doubles runner-up from Stanford -- No. 44 in doubles (-1), unranked in singles. Sam Querrey, 26 years old, San Francisco native, Sacramento Capitals (2012-13) -- No. 61 in singles (+1), No. 151 in doubles (-2). Dmitry Tursunov, 31 years old, trains at Gorin Tennis Academy in Sacramento suburb of Granite Bay -- No. 30 in singles (no change), No. 118 in doubles (+3). Mallory Burdette, 23 years old, NCAA singles runner-up in 2012 and NCAA doubles champion in 2011 and 2012 from Stanford -- No. 1,037 in singles (+6), unranked in doubles. Nicole Gibbs, 21 years old, NCAA singles champion in 2012 and 2013 and NCAA doubles champion in 2012 from Stanford -- Career-high No. 142 in singles (+25), No. 606 in doubles (+3). Macall Harkins, 28 years old, Concord resident -- No. 408 in doubles (-35), No. 692 in singles (-36). Raquel Kops-Jones, 31 years old, San Jose resident, 2003 NCAA doubles champion from Cal -- No. 13 in doubles (no change), No. 1,038 in singles (+6). Maria Sanchez, 24 years old, born and raised in Modesto -- No. 106 in doubles (-1), No. 357 in singles (+41). Allie Will, 23 years old, born in San Mateo -- No. 132 in doubles (-3), No. 503 in singles (+6). Umag (men), early rounds, Tennis Channel, 1-5 p.m. (delay), 5-9 p.m. (repeat), 10 p.m.-1 a.m. Thursday (repeat). Umag (men), round of 16, Tennis Channel, 8:30 a.m.-12:30 p.m., 7-11 p.m. (delay). Atlanta (men), round of 16, Tennis Channel, 1-7 p.m. (live). Gstaad (men), quarterfinals, Tennis Channel, 10 a.m.-2 p.m. (delay), 8-10 p.m. (repeat). Atlanta (men), quarterfinals, ESPN2, 1-3 p.m., 4-6 p.m. (live). Umag (men), quarterfinals, Tennis Channel, 2-6 p.m. (delay). Atlanta (men), quarterfinals, Tennis Channel, 6-8 p.m. (live), 10 p.m.-midnight (repeat). Baku (women), semifinals, Tennis Channel, 8 a.m.-noon (delay). Atlanta (men), semifinals, ESPN2, noon-2 p.m. (live). Gstaad (men), semifinals, Tennis Channel, noon-4 p.m. (delay). Atlanta (men), semifinals, Tennis Channel, 5-7 p.m. (live). Umag (men), semifinals, Tennis Channel, 7-11 p.m. (delay). Baku (women), final, Tennis Channel, 8-10 a.m. (delay), 2-4 p.m. (repeat). Gstaad (men), final, Tennis Channel, noon-2 p.m. (delay), 4-6 p.m. (repeat). Atlanta (men), final, ESPN2, 1-3 p.m. (live). Atlanta (men), final, Tennis Channel, 6-8 p.m., 10 p.m.-midnight (repeat). Umag (men), final, Tennis Channel, 8-10 p.m. (delay). Monday-Aug. 3 -- Bank of the West Classic (women), Stanford. Entries include Serena Williams, Venus Williams, Victoria Azarenka, Agnieszka Radwanska, Angelique Kerber, Dominika Cibulkova, Ana Ivanovic and Samantha Stosur. 2013 champions: Cibulkova, Raquel Kops-Jones-Abigail Spears. Chalk up another national junior title for Roseville and the Sacramento region. Sam Riffice teamed with Vasil Kirkov of Tampa, Fla., to rout Robert Loeb of Hilton Head, S.C., and Alex Phillips of Peachtree City, Ga., 6-1, 6-1 on Saturday for the 16-and-under doubles crown in the USTA Boys National Clay Court Championships in Delray Beach, Fla.
Kirkov and Riffice were seeded first, and Loeb and Phillips were sixth. Riffice's title came one day after Roseville's Keenan Mayo earned the singles crown in the boys 14s in Fort Lauderdale, Fla. In the boys 18 doubles semifinals in Delray Beach, top-seeded William Blumberg of Greenwich, Conn., and Tommy Paul of Coconut Creek, Fla., beat unseeded William Griffith of Fresno and Cameron Klinger of Elk Grove 7-5, 6-0. Blumberg and Paul went on the win the championship, and Paul also took home the singles crown as the top seed. Collin Altamirano and Jenson Brooksby, both of whom train under Joseph Gilbert at the Arden Hills Resort & Spa in Sacramento, won singles titles in the USTA Boys National Championships last August. Altamirano became the first unseeded player in the 71-year history of the 18s in Kalamazoo, Mich., to go the distance. Brooksby triumphed in the 12s in Little Rock, Ark. Northern California juniors earned two titles on Friday in the USTA National Clay Court Championships, and more could come today. Top-seeded Keenan Mayo of Roseville won the boys 14s in Fort Lauderdale, Fla., defeating 12th-seeded Bradley Frye of Overland Park, Kan., 6-3, 6-3. Andrew Ton of Milpitas made it a NorCal sweep in Fort Lauderdale, capturing the boys 14 doubles title with Brandon Nakashima of San Diego. Seeded No. 7, Nakashima and Ton outclassed No. 9 Campbell Erwin of Olmos Park, Texas, and Nathan Han of Tulsa, Okla., 6-2, 6-3. Meanwhile, top-seeded Vasil Kirkov of Tampa, Fla., and Sam Riffice of Roseville will meet sixth-seeded Robert Loeb of Hilton Head, S.C., and Alex Phillips of Peachtree City, Ga., for the boys 16 doubles crown today in Delray Beach, Fla. In the boys 18 semifinals in Delray Beach, unseeded William Griffith of Fresno and Cameron Klinger of Elk Grove will face top-seeded William Blumberg of Greenwich, Conn., and Tommy Paul of Coconut Creek, Fla.
-- Ninth-seeded Sarah Bahsoun of Los Gatos and Niluka Madurawe of Sunnyvale by walkover in the girls 14 doubles semifinals in Plantation, Fla.
-- Top-seeded Katie Volynets of Walnut Creek in the girls 12 singles semifinals in Palm Beach Gardens, Fla.
-- No. 1 seeds Charlotte Owensby of Boca Raton, Fla., and Volynets in the girls 12 doubles quarterfinals in Palm Beach Gardens. Top-seeded Keenan Mayo of Roseville in the Sacramento area beat third-seeded Robert Baylon of Buena Park 7-5, 6-4 on Thursday to reach the final of the USTA Boys 14 National Clay Court Championships in Fort Lauderdale, Fla.
Mayo will face 12th-seeded Bradley Frye, an Overland Park, Kan., resident who defeated seventh-seeded Christian Alshon of Boca Raton, Fla., 6-3, 6-3. Mayo's brother, Aidan, was seeded second in the National Clay Court 12s in Winston-Salem, N.C. He fell to 11th-seeded Faris Khan of San Antonio 6-1, 6-4 in the semifinals. In the girls 12 quarterfinals in Palm Beach Gardens, Fla., top-seeded Katie Volynets of Walnut Creek in the San Francisco Bay Area outlasted eighth-seeded Alexa Noel of Summit, N.J., 1-6, 6-4, 6-2. Volynets also reached the doubles quarterfinals with Charlotte Owensby of Boca Raton. They are seeded first. -- Unseeded William Griffith of Fresno and Cameron Klinger of Elk Grove to the boys 18 round of 16 in Delray Beach, Fla.
-- Top-seeded Vasil Kirkov of Tampa, Fla., and Sam Riffice of Roseville to the boys 16 quarterfinals in Delray Beach. -- Seventh-seeded Brandon Nakashima of San Diego and Andrew Ton of Milpitas to the boys 14 final in Fort Lauderdale. 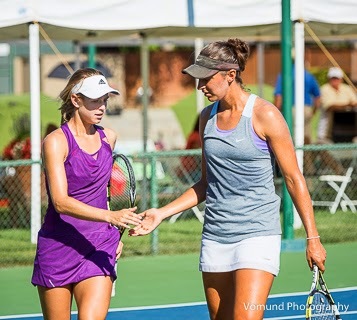 -- Ninth-seeded Sarah Bahsoun of Los Gatos and Niluka Madurawe of Sunnyvale to the girls 14 semifinals in Plantation, Fla.
grams), has published an e-book about her four years at USC. Danielle Lao has been a pro for less than a year, but she already has published a book. Lao collaborated with Atlanta free-lance writer Rick Limpert on "The Invaluable Experience," released last December as a self-published e-book on Amazon. The 80-page work chronicles Lao's four years at USC, where she earned All-America honors in singles in 2012 and 2013. "It was the best experience of my life," the 5-foot-3 (1.61-meter), 120-pound (54-kilogram) Lao said last week after defeating 6-foot-2 (1.88-meter) Samantha Crawford to reach the quarterfinals of the $50,000 FSP Gold River Women's Challenger in the Sacramento area. "I started blogging about all the great things I learned not only about tennis but life in general. I was sad that college was ending, and (Limpert) found it and wanted to turn it into a book." Asked what she learned at USC, the 23-year-old Pasadena product said: "Life is a marathon, not a sprint. You have to be able to face the music -- that's a term I like to use -- whether it's on the tennis court or dealing with people you love." Lao elaborated on her pet phrase. "You don't need things to be perfect," she explained. "It's about finding a way to maximize what you have on that day instead of complaining about what's wrong. It's not being afraid of failing." Maybe Crawford, 19, should read Lao's book. The 2012 U.S. Open girls champion and a semifinalist at the inaugural Gold River Challenger that year, Crawford grew frustrated by her repeated errors against Lao and stopped chasing balls in the second set of her 6-4, 6-1 loss. Lao was gracious and diplomatic while discussing Crawford's performance. "Sam is a great player," Lao said. "She has a lot of big shots. I guess mentally I was a little more focused. I've practiced with her. I played well, but she's had better days." Lao's greatest strength, she said, is "being patient with myself. I'm 5-3 and 120 pounds. It's not size and power. It's upstairs, what goes on in your mind between points. It's realizing that you can't play your best every day, that there's always a way to win even when you're not playing your best." Lao, who's working on a new book about the pro tour, has improved her world singles ranking from No. 576 at the end of 2013 to No. 402. Her rise in doubles has been even more dramatic, from No. 763 in the year-end rankings to No. 266 after reaching the Gold River semifinals with former Arizona State standout Jacqueline Cako. The daughter of a mortgage banker and stay-at-home mother, Lao is as polite as she is positive. She began an interview by asking a reporter to repeat his first name and ended it by saying, "Nice meeting you, sir." Nicknamed "The Little Giant," Lao conceded that her size is "a disadvantage, but it can be used to your advantage as long as you manage it correctly. There are days when a bigger serve and forehand would help, but if I sit around and complain, I won't have a career anymore. I'll be done." after losing early in the Gold River Challenger. Former Stanford star Nicole Gibbs dropped from a career-high No. 145 in the world in singles to No. 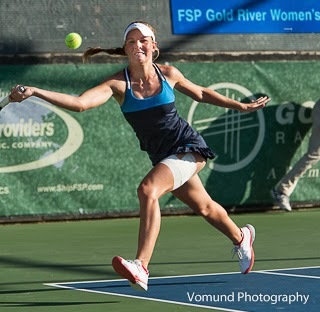 167 after losing in the second round of last week's $50,000 FSP Gold River Women's Challenger in the Sacramento area. Gibbs won the $50,000 Yakima (Wash.) Challenger during the corresponding week last year, one month after forgoing her senior year at Stanford and turning pro. Rankings are compiled on a 52-week revolving basis. Gibbs also fell 68 places to No. 609 in doubles after playing singles only in the Gold River Challenger. She reached the doubles quarterfinals in Yakima last year with then-UCLA standout Robin Anderson. Gibbs, 21, of Marina del Rey in the Los Angeles area, became the fifth woman in history -- and fourth from Stanford -- to win back-to-back NCAA singles titles (2012 and 2013). She also won the 2012 NCAA doubles crown with Mallory Burdette and led the Cardinal to the 2013 team title. after reaching the Gold River semifinals with Peggy Porter. Meanwhile, Macall Harkins of Concord in the San Francisco Bay Area, rose 69 spots in doubles to No. 373 and 47 notches in singles to No. 656. Harkins, a 28-year-old left-hander who's 6 feet (1.84 meters) tall, reached the Gold River doubles semifinals with Peggy Porter, 18, of Dallas. Harkins also qualified for the singles main draw before losing to top seed and eventual champion Olivia Rogowska of Australia. Bradley Klahn, 23 years old, 2010 NCAA singles champion and 2011 NCAA doubles runner-up from Stanford -- No. 77 in singles (-3), No. 177 in doubles (+4). Scott Lipsky, 32 years old, 2002 NCAA doubles runner-up from Stanford -- No. 43 in doubles (no change), unranked in singles. Sam Querrey, 26 years old, San Francisco native, Sacramento Capitals (2012-13) -- No. 62 in singles (+1), No. 149 in doubles (+2). Dmitry Tursunov, 31 years old, trains at Gorin Tennis Academy in Sacramento suburb of Granite Bay -- No. 30 in singles (no change), No. 121 in doubles (-4). Mallory Burdette, 23 years old, NCAA singles runner-up in 2012 and NCAA doubles champion in 2011 and 2012 from Stanford -- No. 1,043 in singles (+2), unranked in doubles. Nicole Gibbs, 21 years old, NCAA singles champion in 2012 and 2013 and NCAA doubles champion in 2012 from Stanford -- No. 167 in singles (-22), No. 609 in doubles (-68). Macall Harkins, 28 years old, Concord resident -- No. 373 in doubles (+69), No. 656 in singles (+47). Raquel Kops-Jones, 31 years old, San Jose resident, 2003 NCAA doubles champion from Cal -- No. 13 in doubles (no change), No. 1,044 in singles (+2). Maria Sanchez, 24 years old, born and raised in Modesto -- No. 105 in doubles (no change), No. 398 in singles (+1). Allie Will, 23 years old, born in San Mateo -- No. 129 in doubles (-7), No. 509 in singles (-6). Hamburg (men), early rounds, Tennis Channel, 3-11 a.m. (live), 2:30-4 p.m. (repeat), 5-7 p.m. (repeat). Bastad (women), early rounds, Tennis Channel, 11 a.m.-2:30 p.m. (delay). Hamburg (men), round of 16, Tennis Channel, 3-11 a.m. (live), 3-7 p.m. (repeat), 9-11 p.m. (repeat). Bastad (women), round of 16, Tennis Channel, 11 a.m.-3 p.m. (delay), 7-9 p.m. (repeat). Hamburg (men), quarterfinals, Tennis Channel, 3-11 a.m. (live), 3-7 p.m. (repeat), 9-11 p.m. (repeat). Bastad (women), quarterfinals, Tennis Channel, 11 a.m.-3 p.m. (delay), 7-9 p.m. (repeat). Hamburg (men), semifinals, Tennis Channel, 6:30-11 a.m. (live), 3-5 p.m. (semifinal 1 repeat), 7-9:30 p.m. (semifinal 2 repeat). Bastad (women), semifinals, Tennis Channel, 11 a.m.-3 p.m. (delay), 5-7 p.m. (semifinal 1 repeat), 9:30-11:30 p.m. (semifinal 2 repeat). Hamburg (men), final, Tennis Channel, 6-8:30 a.m. (live), 10:30 a.m.-1 p.m. (repeat), 3-5 p.m. (repeat), 7-9:30 p.m. (repeat). Bastad (women), final, Tennis Channel, 8:30-10:30 a.m. (delay), 1-3 p.m. (repeat), 5-7 p.m. (repeat). Bogota (men), final, Tennis Channel, 9:30-11:30 p.m. (delay). Through Saturday -- USTA National Clay Court Championships (boys and girls), various sites. July 28-Aug. 3 -- Bank of the West Classic (women), Stanford. Entries include Serena Williams, Petra Kvitova, Victoria Azarenka, Agnieszka Radwanska, Angelique Kerber, Dominika Cibulkova, Ana Ivanovic and Samantha Stosur. 2013 champions: Cibulkova, Raquel Kops-Jones-Abigail Spears. Lindsay Davenport, who starred for the now-defunct Sacramento Capitals in World TeamTennis, was inducted into the International Tennis Hall of Fame on Saturday in Newport, R.I.
Davenport, 38, was enshrined with five-time Paralympic medalist Chantal Vandierendonck, coach Nick Bollettieri, executive Jane Brown Grimes and British broadcaster and announcer John Barrett. They bring the membership of the Hall of Fame, which is celebrating its 60th anniversary this year, to 235 people representing 20 countries. Davenport, 6-foot-2 (1.89 meters), reached No. 1 in the world in singles and doubles. The resident of Laguna Beach in Southern California won six Grand Slam titles -- three in singles (1998 U.S. Open, 1999 Wimbledon and 2000 Australian Open) and three in doubles (1996 French Open with Mary Joe Fernandez, 1997 U.S. Open with Jana Novotna and 1999 Wimbledon with Corina Morariu). Davenport also earned the singles gold medal in the 1996 Atlanta Olympics. With the Capitals, Davenport was named the WTT Female Rookie of the Year at 17 years old in 1993 and the Female MVP in 1997. She competed on three of Sacramento's record six WTT championship teams -- in 1997, 1998 and 2007. Down to earth and unfailingly cooperative with the media, Davenport also was one of the most popular players in tennis. Bollettieri founded the Nick Bollettieri Tennis Academy, the first full-time tennis boarding school, in Bradenton, Fla., in 1978. Alumni include Hall of Famers Andre Agassi, Jim Courier and Monica Seles, future Hall of Famer Maria Sharapova and former doubles No. 1 Anna Kournikova. The Capitals announced on Feb. 4 that they were moving to Las Vegas after 28 years in the Sacramento area because management no longer wanted to spend $125,000 annually to set up a temporary stadium. WTT disbanded the team one month later after Capitals owner Deepal Wannakuwatte was charged with conspiracy and mail, wire and bank fraud. He was accused of orchestrating a $150 million scheme while recruiting investors for his medical supply business. Wannakuwatte, 63, pleaded guilty in May to one count of wire fraud and is scheduled to be sentenced on July 24. Under terms of the plea agreement, the government will recommend 20 years in prison, the maximum allowed. Wannakuwatte bought the Capitals in 2012 after previous owner Bob Cook went bankrupt. third, 4-6, 6-2, 6-2 to reach the final of the Gold River Challenger. Madison Brengle can't seem to stay healthy for an entire week in the $50,000 FSP Gold River Women's Challenger. One year after coming down with a stomach ailment on the day of the final and losing, the third-seeded Brengle hurt her right knee and lost to top-seeded Olivia Rogowska 4-6, 6-2, 6-2 in Friday night's semifinals at the Gold River Racquet Club in the Sacramento area. Rogowska, a 23-year-old Australian, and Brengle, a 24-year-old American, are roommates and best friends who train in Bradenton, Fla.
"I got revenge for the last time we played," Rogowska said. "She skunked me." Rogowska was referring to Brengle's 6-2, 6-0 victory in the final of a $25,000 Challenger, also on hardcourts, in Landisville, Pa., last August. It was their only previous meeting. No. 7 seed Julia Boserup routed No. 8 Nao Hibino 6-1, 6-3. Rogowska, who has dropped the opening set in her last two matches, will meet seventh-seeded Julia Boserup of Newport Beach for the first time after tonight's 7 o'clock doubles final. Boserup, 5-foot-11 (1.80 meters) and 145 pounds (66 kilograms), overpowered little Nao Hibino, seeded eighth, of Japan 6-1, 6-3. "The score was not indicative of the match," Boserup, 22, said after her first career match against Hibino, 19. "She is a very impressive player." Hibino was trying to become the second consecutive Japanese teenager to win the Gold River Challenger. 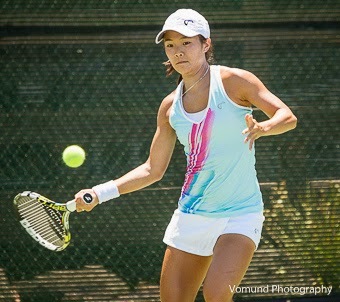 Mayo Hibi triumphed last year at 17 but chose to play in a $25,000 Challenger in Gatineau, Canada, this week instead. Hibi, seeded fifth, lost to top-seeded Risa Ozaki, also of Japan, in Friday's quarterfinals. Brengle began hobbling midway through the second set. She took a medical timeout early in the third set and had her knee taped but limped through the rest of the match. Rogowska played with her left thigh taped for the first time this week but didn't seem bothered. At first glance, the final looks like a mismatch. Rogowska is ranked almost 100 places higher in the world than Boserup, 127 to 222. Also, Rogowska has won nine career ITF (minor-league) titles in singles and 15 in doubles to Boserup's two and none, respectively. Rogowska hits hard for someone only 5-foot-9 (1.75 meters) and 128 pounds (58 kilograms), and she's mentally tough. She came within a tiebreaker of losing in straight sets to sixth-seeded Sachia Vickery, 19, in the quarterfinals but pulled out the match. But Boserup is not to be underestimated. Her ranking is deceptively low because she missed the first half of last year with a bulging disc -- returning in the Gold River Challenger and losing to former top-20 player Alisa Kleybanova in the last round of qualifying -- and tumbled to No. 510. This year, Boserup is showing what she can do when healthy. As a qualifier in Monterrey, Mexico, on the elite WTA tour in April, she stunned 2013 Wimbledon semifinalist Kirsten Flipkens, a Belgian ranked 25th at the time, en route to the quarterfinals of the hardcourt tournament. Boserup not only is more powerful than Rogowska but fresher, having not lost a set in the Gold River Challenger. Temperatures have reached the 90s (32.2-37.8 Celsius) all week. Also, Boserup has the homecourt advantage. Both of her titles have come in $25,000 tournaments in her native California, at Rancho Santa Fe in the San Diego area in 2012 and at Redding in 2011. The doubles final features two unseeded teams. Modesto product and USC graduate Maria Sanchez and current Trojan Zoe Scandalis will face Daria Gavrilova of Russia and Storm Sanders of Australia. In the inaugural Gold River Challenger two years ago, Sanchez won the singles title and reached the doubles final with then-Trojan Kaitlyn Christian. Sanders, a left-hander, won last year's doubles crown at 18 with 6-foot-2 (1.89-meter) Naomi Broady of Great Britain. Broady did not return this year after advancing to the Wimbledon mixed doubles quarterfinals with countryman Neal Skupski. Tickets for the finals of the Gold River Challenger are $10. The matches will be streamed live at www.goldriverchallenger.com. Olivia Rogowska (1), Australia, def. 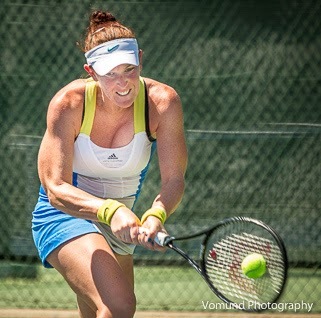 Madison Brengle (3), United States, 4-6, 6-2, 6-2. Julia Boserup (7), United States, def. Nao Hibino (8), Japan, 6-1, 6-3. Daria Gavrilova, Russia, and Storm Sanders, Australia, def. Jacqueline Cako and Danielle Lao, United States (3), 6-2, 7-6 (6). Maria Sanchez and Zoe Scandalis, United States, def. Macall Harkins and Peggy Porter, United States, 6-7 (2), 6-2 [10-7]. Maria Sanchez and Zoe Scandalis, United States, vs. Daria Gavrilova, Russia, and Storm Sanders, Australia. Olivia Rogowska (1), Australia, vs. Julia Boserup (7), United States. in the semifinals of the Gold River Women's Challenger. 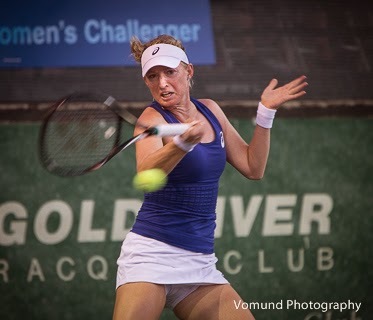 GOLD RIVER, Calif. -- Madison Brengle will have mixed emotions when she faces Olivia Rogowska this evening in the semifinals of the $50,000 FSP Gold River Women's Challenger. "She is my roommate and closest friend," Brengle said. "She is a great person." Rogowska, 23, of Australia and Brengle, a 24-year-old American, train in Bradenton, Fla. Seeded first and third, respectively, they held off young Americans in tough three-set matches on Thursday at the Gold River Racquet Club in the Sacramento area. In the other semifinal, seventh-seeded Julia Boserup of Newport Beach will take on eighth-seeded Nao Hibino of Japan. They eliminated promising U.S. teenagers Louisa Chirico and Jamie Loeb, respectively. Rogowska, ranked No. 127 in the world, edged 19-year-old Sachia Vickery of Hollywood, Fla., 2-6, 7-6 (4), 6-4. Rogowska saved four break points at 5-5 in the second set, won four of the last five points in the tiebreaker and overcame a 3-0 deficit (one break) in the third set. "At these tournaments, the level of play is similar," observed Rogowska, who has reached the second round of singles three times in Grand Slam tournaments. "The difference is all mental. You have to have self-belief." 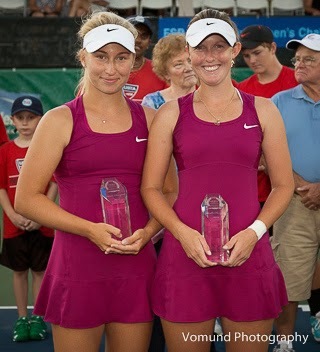 Vickery won the USTA National Girls 18s singles and doubles titles last August. She then beat Mirjana Lucic-Baroni, a Wimbledon semifinalist in 1999, in the first round of the U.S. Open before losing to qualifier Julia Glushko of Israel in the second round. "Vickery is a very tough player," Rogowska said. "I was proud of how I held it together." Brengle, ranked No. 158, outlasted 5-foot-3 (1.61-meter) Danielle Lao 6-4, 6-7 (9), 6-3. Lao, a 23-year-old former USC All-American, saved two match points in the second set. 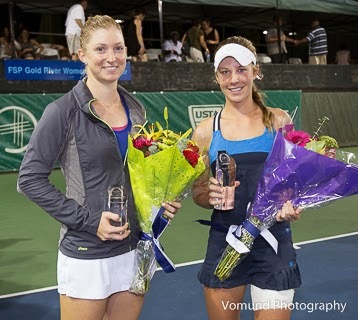 "Danielle has a tricky game," said Brengle, the runner-up in last year's Gold River Challenger. "She's very consistent and a good mover. You have to stay very mentally tough, working to create angles." Brengle has played Rogowska only once in a tournament, winning by the surprisingly one-sided score of 6-2, 6-0 in the final of a $25,000 Challenger in Landisville, Pa., last August. Rogowska had been extended to 2-6, 7-6 (3), 6-2 in the semifinals, whereas Brengle had breezed 6-1, 6-2. Boserup, 22, and Hibino, 19, will meet for the first time. Boserup is ranked No. 222 and Hibino No. 227. 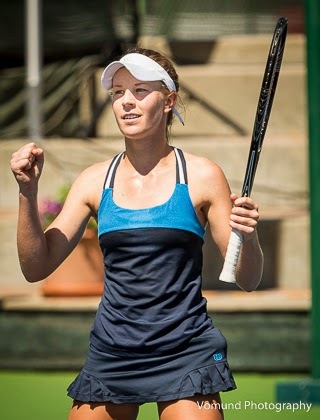 Boserup, a hard hitter at 5-foot-11 (1.80 meters) and 145 pounds (66 kilograms), reached the quarterfinals as a qualifier in Monterrey, Mexico, on the elite WTA tour in April. In the first round, she beat then-No. 25 Kirsten Flipkens, a Belgian who advanced to the Wimbledon semifinals last year. Hibino reached the final of a $25,000 Challenger on hardcourts in Fergana, Uzbekistan, last month. She is bidding to become the second consecutive Japanese teenager to win the Gold River tournament. Mayo Hibi prevailed at 17 last year but chose to play in a $25,000 event in Gatineau, Canada, this week instead. Seeded fifth, she will meet top-seeded Risa Ozaki, another Japanese player, in today's quarterfinals. Boserup, who squandered a 5-0 lead in the first set against Chirico before recovering, is the only player in the Gold River Challenger who has not lost a set. Not coincidentally, she has yet to face a seed, but that will change tonight. Olivia Rogowska (1), Australia, def. Sachia Vickery (6), United States, 2-6, 7-6 (4), 6-4. Madison Brengle (3), United States, def. Danielle Lao, United States, 6-4, 6-7 (9), 6-3. Nao Hibino (8), Japan, def. Jamie Loeb, United States, 4-6, 6-3, 6-4. Julia Boserup (7), United States, def. Louisa Chirico, United States, 7-5, 6-3. Macall Harkins and Peggy Porter, United States, def. Natalie Pluskota and Keri Wong (2), United States, 6-3, 5-7 [10-7]. Maria Sanchez and Zoe Gwen Scandalis, United States, def. Jamie Loeb and Allie Will, United States, walkover. Maria Sanchez and Zoe Gwen Scandalis, United States, vs. Macall Harkins and Peggy Porter, United States. Olivia Rogowska (1), Australia, vs. Madison Brengle (3), United States. Julia Boserup (7), United States, vs. Nao Hibino (8), Japan. Jacqueline Cako and Danielle Lao (3), United States, vs. Daria Gavrilova, Russia, and Storm Sanders, Australia.